There weren’t many surprises, except maybe Joe O’Connor beating Andrew Higginson fair and square, and Jak Jones beating the hard as nail Joe Swail, having needed two snookers in the decider. Some feat! There were however a few scares. 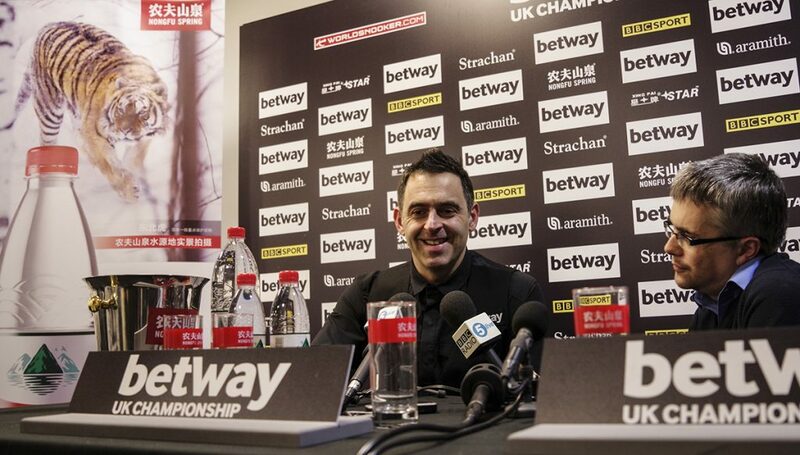 Ronnie, Ding Junhui, Luca Brecel and Judd Trump all were taken to a decider. Ronnie O’Sullivan came from 4-1 down to beat Ken Doherty 6-5 and keep alive his hopes of a seventh Betway UK Championship title. Following the early exits of Mark Selby, Shaun Murphy and John Higgins, another shock looked on the cards in York when defending champion O’Sullivan started slowly against 49-year-old veteran Doherty. But the Rocket turned the match around and came out on top in an exciting conclusion to set up a last-32 meeting with China’s Zhou Yuelong. O’Sullivan currently shares Steve Davis’s record of six UK titles as well as Stephen Hendry’s mark of 18 Triple Crown victories so he will make a new piece of snooker history if he lifts the trophy in a week’s time. World number three O’Sullivan has already landed the Shanghai Masters and Champion of Champions titles within the past three months and has now won 21 of his 23 matches this season. But it was 1997 World Champion Doherty who dominated the early stages today as breaks of 66, 76, 77 and 71 put him 4-1 ahead. He also had chances in frame six but couldn’t take them and O’Sullivan launched his come back with a run of 75. Further breaks of 76 and 65 helped put five-time World Champion O’Sullivan 5-4 up. He could have closed out the match in frame ten but missed the brown to a centre pocket and his opponent punished him with a run of 48 to make it 5-5. O’Sullivan had first chance in the decider and made 31 before running out of position. Doherty had one opportunity but could only make 6 before missing a tough long pot to a baulk corner. O’Sullivan got back in with an excellent mid-range red to a top corner and added 58 to seal the result. 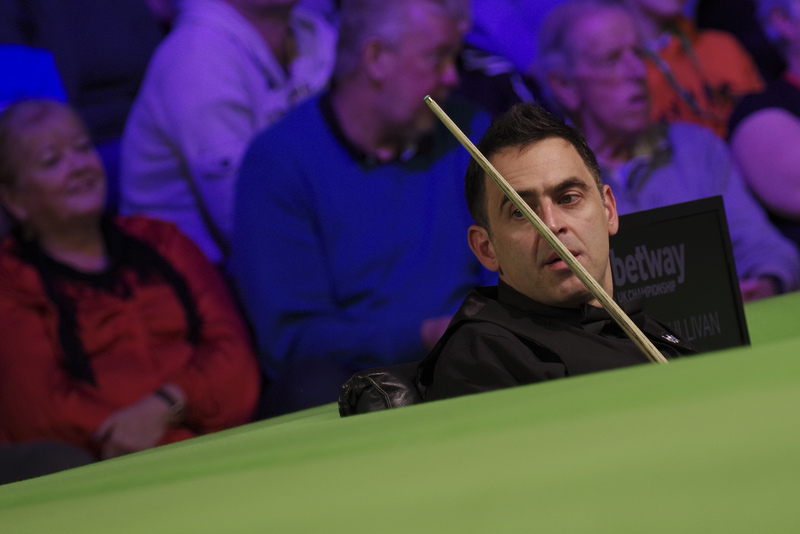 “Ken played marvellously well for the first five frames, it was such fluent stuff,” said O’Sullivan. “He was playing with freedom and that’s hard to stop. I had to be patient. I was nervous at the start and shaking, and when that happens your opponent senses it. Ding Junhui got the better of a tense finish to edge out Matthew Selt 6-5 . Two-time UK Champion Ding now meets Xiao Guodong in a Chinese derby. Selt top scored with 130 as he took a 4-2 lead, then Ding recovered to 4-4. Romford’s Selt won the ninth and had a chance to clear from 55-0 down in the tenth but narrowly missed an attempted double on the last red. Ding got the better of a safety battle on the red and made it 5-5. 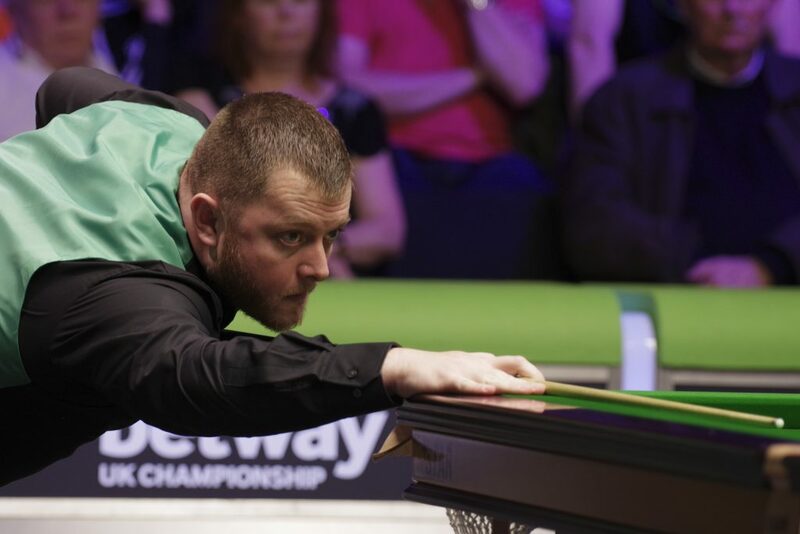 Both players had chances in the decider and Selt crucially missed the green to a baulk corner after potting the last red with the score at 34-45. World number eight Ding took advantage to book his third round spot. Luca Brecel made three consecutive centuries, 135, 109 and 101, during a 6-5 win over Liam Highfield. David Gilbert’s break-building was even more impressive in a 6-4 win over Peter Ebdon. Yushan World Open finalist Gilbert made a 131 in the opening frame and also had three tons in a row from 2-1 down, knocking in 134, 133 and 100. China’s Yan Bingtao thrashed Paul Davison 6-1 while Martin O’Donnell made a 139 in a 6-2 win over Chen Feilong. More big breaks came from Gary Wilson as he beat Sam Baird 6-3 with 85, 113, 63, 103 and 93. Jak Jones beat Joe Swail 6-5 in a dramatic finish. Welshman Jones needed two snookers on the colours in the deciding frame but got them before clearing from blue to black for victory. 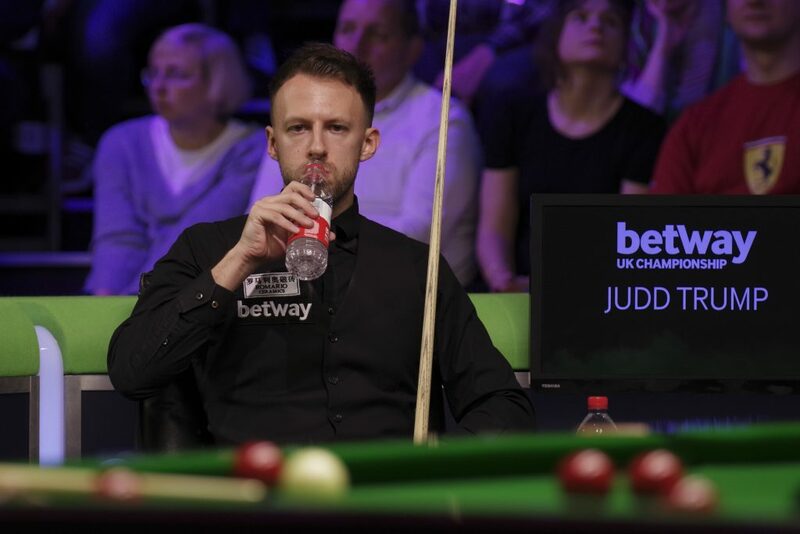 Judd Trump made a century in the deciding frame to beat Dominic Dale 6-5 and reach the third round of the Betway UK Championship. Trump surprisingly missed match-ball twice in the tenth frame but was able to compose himself and close out victory in style as he went through to the last 32 to face Mark King on Tuesday afternoon in York (Tickets still available, click herefor details). World number five Trump captured his ninth ranking title at last month’s Northern Ireland Open and is looking to keep his winning run going. His only previous Triple Crown success came at this tournament seven years ago. From 2-0 down tonight, Trump took five of the next six frames with a top break of 110 to lead 5-3. Dale pulled one back with a run of 69. Frame ten came down to the colours and Trump potted an excellent long blue and added the pink to leave himself the black off its spot. Remarkably he rattled it in the jaws, and later missed another chance at the black, allowing Dale to pot it and force the decider. But Trump needed only one chance in the last frame as a fine break of 112 secured his progress. “I’m very happy with the way I got over the line, ” said Bristol’s Trump. “I could have folded after missing that black and chucking the frame away. I really had to dig in, as much as I ever have done in my career. I tried to draw a bit of inspiration from Ronnie’s come back earlier because I could see how much it meant to him. I had to produce the goods under pressure. Masters champion Mark Allen battled to a 6-2 win over Rory McLeod with a top run of 92. He now meets Iran’s Hossein Vafaei who made a 139 in a 6-4 win over Martin Gould. Marco Fu saw off Luo Honghao 6-2 with a top run of 144, the new front-runner for the £5,000 high break prize. The Hong Kong ace also knocked in 124, 83 and 85. That set up a showdown with Jack Lisowski which will be crucial in the Race to the Masters. If Fu loses he will be out of the race, while if he wins and then goes on to reach the quarter-finals he will move ahead of Lisowski in the battle for places at Alexandra Palace. Graeme Dott saw off Matthew Stevens 6-2 with a top break of 73 while Ali Carter top scored with 104 in a 6-4 defeat of Chris Wakelin. Also Ronnie got everyone talking again as he said he was “ready” to breakaway from the main tour if the opportunity presented itself. Although that’s clearly not just right now.